Summer is over – no worries “swing into fall fitness” to maintain your perfect beach body. Across the boroughs, City Parks Foundation is kicking off its 2018 Fall Sports Program for seniors this month. 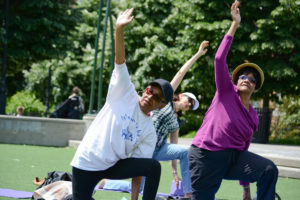 This Fall, 500 seniors in 26 neighborhood parks and recreation centers are able to participate in FREE programs in yoga and fitness walking instruction. Registration for all programs are now open online and in-person at each park site.